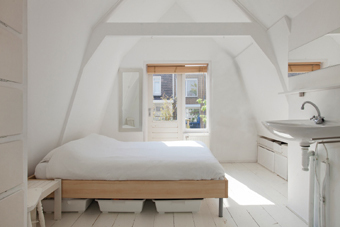 Renovation of roof space to a living or bedroom function is frequently done. Often the top floor is used for storage and if you want to use it as living or sleeping space a building permit conforming to regulations is required. If you don’t want to move house renovation can be the best solution. My ethos is one of fully understanding my client’s needs and sensitively translating these into designs of the highest standards. Through dialogue and impeccable attention to detail, I can create contemporary, elegant and practical solutions of exceptional quality. A successful renovation requires good preparation and a good design is not just a pretty picture. For change of use a building permit is necessary, adhering to the latest building regulations. King Architects can incorporate any other plans, such as roof terrace and skylights if these are required by city council regulations. Dependent on your own knowledge and experience you can choose the degree of building management which suits you. You can choose per phase, combinations of phases or for the complete building management. From comparing tenders to the complete building management.